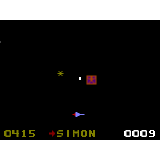 Defender, my favourite G7000 game. Made for an EO competition of making a game revolving around the theme of flight in 2 days time. As I missed the start of the competition this game was made in a matter of hours.